America “Hangs by a Thread” …Prophetic? Today, as we start the radio program, America is hanging by a thread. So we have to see what we can do with a thread. At the end of the day, our freedom has been assaulted. This is the kind of change that people did not think they were going to get when they voted for Barack Obama. Freedom must win the day. 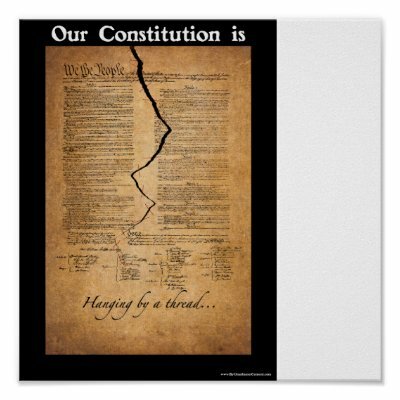 Even this nation will be on the verge of crumbling to pieces and tumbling to the ground and when the Constitution is on the brink of ruin this people will be the staff upon which the nation shall lean and they shall bear the Constitution away from the very verge of destruction. The time would come when the constitution and government would hang by a brittle thread and would be ready to fall into other hands but this people the latter-day saints will step forth and save it. I can’t say whether or not this current possible constitutional crisis is severe enough to spark the fulfillment of this prophecy. However, I do believe that our government (probably on both sides of the aisle) has been so corrupted that it is incumbent on good, honorable, and honest people to uphold the Constitution. Today in Church, we sang the Hymn “O My Father”, a hymn I have sung many times before. However, I never took the time to read and ponder the lyrics. I did so today and felt the spirit strongly. I think the lyrics could be my favorite of all our Hymns . The personal feeling and conviction in the hymn is inspiring. It also sends me into deep thoughts and ponderings as it is one of the few published works by the LDS Church that refers to a Heavenly Mother, a belief that I whole heartedly subscribe to. Here is the wikipedia entry for this hymn. Easter is more than just bunnies, chocolate, and Easter dresses. Like Christmas, Easter has been commercialized. While I don’t have a huge problem with that, this commercialization has caused many to forget why we celebrate this holiday. I hope this video will renew or strengthen in you the reason why we have Easter. President Obama’s biggest push in this down economic climate appears to be punishing the “evil”, “greedy” corporations who caused this mess (a claim that is dubious at best). He wants to be the next FDR, a champion of the little-man, a champion of those who are poor. That is well and good, it is extremely important that we as a society take care of those less-fortunate than I. But increasing the tax burden on corporations and the wealthy, while claiming to cut taxes for those don’t actually pay taxes is not the way to do it. Among the most basic principles of fiscal economics is that raising taxes stifles business growth, at least in a competitive world – which we reside in. If one pushes and pushes, they will eventually push business out. Thus, losing jobs in America. There is a reason that various states and foreign governments lower their corporate tax structure: to lure business. This is no secret, yet President Obama seems so bent on “punishing” corporations (most of which are ethical, productive, and valuable to our culture and society) that he completely disregards the economic consequences and, thus, the long-term health of our country; not to mention the long-term negative impact to the people in our country that he says he is most concerned about. A few months ago when Secretary Gates and the Department of Defense listed Mexico as one of the countries in the future that face destabilization. At the time the Mexican Government and many in America scoffed at the idea. But now the reasoning for DoD’s warning is becoming apparent and probably sooner than anyone expected. Historically, Mexico’s internal problems have been with Zaptista and other rebels in in its southern provinces. While these rebels have certainly been formidable and been the occasional thorn in the Government’s side, they have been something that the Government has been able to deal with. These groups have mostly just been a cause for Rights Activists in the U.S. and elsewhere, but no big deal. The new threat in Mexico is scary, well-funded, and a real threat to Mexico and even the SW United States. This threat is the battles between various drug cartels and their battles with the Mexican police force and government. Over the past half-year battles have raged in northern Mexico between these cartels. People have been murdered, villages pillaged, and women raped. It has gotten so bad that Ciudad Juarez has been determined the most dangerous city in Mexico and Mexican government had to send its military into the city. What makes this scarier is that Ciudad Juarez is literally on the U.S. border and shares the Rio Grande with El Paso, TX and there are indications that these drug wars are seeping into U.S. territory with an increase in drug-related murders and other criminal activity in places along the border from Houston to San Diego. With this recent development of the Mexican army entering Ciudad Juarez it greatly increases the likelihood of a Mexican Civil War, however hopefully this is a minor threat and will not spill over throughout Mexico. As long as the cartels can say divided against each other there is a good chance a civil war can be avoided. The Mexican army’s best course of action may not be to stop all the violence but only to maintain law and order in its towns and cities and protect the innocents not involved in the drug trade. It may be in their best interest to allow the drug cartels to battle it out and attenuate their numbers and, hopefully, influence. But a long-term solution to this problem with the drug trade is more complicated. Most importantly is that the government needs to ensure that it is providing opportunities for economic growth, aka in needs provide job growth. There also needs to be good local governance and infrastructure improvements. The government needs to ensure that it or peaceful entities are providing the services and security people need rather than the cartels. They must not allow the cartels to do their jobs. For the United States the threat is certainly not as dire, but it needs to watched closely; fortunately the Obama administration is doing so. It was reported today that the administration is looking at the possibility of deploying the National Guard to the border (but isn’t that more of a Governor’s decision?). Certainly there are political considerations to be made here, we don’t want to be “occupying” our own territory with the military. Nor do we want to get directly involved militarily with an internal Mexican struggle aside from perhaps providing equipment and logisitical support to Mexico’s army. Nevertheless this situation needs to be watched closely and our media and people need to take this more seriously. How can there be such a major crisis right on our border, but no one seems to know or care? This threat in Mexico is both among the most serious facing U.S. Foreign Policy and also one of the best opportunities for us and Mexico to counter the drug trade and to help Mexico along in its next step towards modernization. Remember it wasn’t until the 1990’s that Mexico became a democracy, they still have a long way to go. This is re-posted from Race42012.com, thanks to the author, MWS, for allowing me to share it. When Ronald Reagan took office, the National Debt was $934 billion dollars. That was about 30% of GDP. When George W. Bush took office, the Debt was $5.7 trillion. That was about 60% of GDP (that figure actually dropped in the Clinton years). Currently, the debt is fast approaching $11 trillion, close to 70% of GDP. INTEREST on the National Debt in FY08 amounted to $451 billion, around 20% of government expenditures, and $1500 for every man, woman, and child in America. The deficit for just the first four months of FY09 is $569 billion. Obama’s “stimulus” hasn’t even begun. Obama has assured us that we will have trillion dollar deficits for years to come. That means that the next Republican President- even if she wins in 2012- will inherit a cumulative debt around $15 trillion. Considering that the economy is currently shrinking, and that the CBO projects that Obama’s “stimulus” will drag the economy in a few years, that means the next Republican President could well inherit a debt that is larger than our entire annual economic output. The economic boom of the last 25 years was largely artificial. While the federal government spent around $10 trillion we didn’t pay for, the private sector followed suit. According to the Federal Reserve, Americans held around $2.5 trillion in consumer debt at the end of 2008. That’s about $8500 per capita, and THIS DOES NOT INCLUDE MORTGAGES. Estimates vary, but leverage and falling home values probably have 20-30% of homeowners owing more on their homes than they are worth. While we are not Argentina, it is worth noting that Argentina had a National debt less than 60% of GDP when they defaulted in the 90s. They still haven’t recovered. It seems clear to me, at least, that we are on a downward spiral that is going to end very badly. China is already closing off the tap of credit, as they are funding their own $600 billion stimulus. I cannot see how the not-too-distant future does not bring high inflation and high interest rates. And all of these problems don’t even begin to address the looming insolvency of Social Security and Medicare. It is high time that we acknowledge that we have both a moral and an economic imperative to raise taxes as soon as the economy stabilizes. It is time to forget everything you learned on the radio about economics. We have a moral obligation to pay our bills. Now I can already hear the objections. “We are already overtaxed!” That may be true, but we still aren’t paying for what we are spending. And for historical perspective, the top marginal rate in Reagan’s 6th year of office was 50%, and that rate kicked in at a lower income than Carter’s top rate (adjusted for inflation). So for most of the “miraculous 80s” the top rate was 50%. In the roaring 90s, the top rate was 40%. Currently, it stand at 35%. Now I know you don’t raise taxes in a recession, but raising them when the economy stabilizes will not be the end of civilization. Objection #2 brings in the full force of Talk Show Economics. “Cutting taxes INCREASES revenue, and raises taxes DECREASES revenue.” This is only half true, and only to an extent. Generally, lower taxes stimulate growth, so it is fair to say that cutting taxes raises more revenue than would have been raised at the lower rate had the economy not grown. But it is not necessarily true that tax cuts raise more revenue than would have been raised had the rate not been cut. It depends on what part of the Laffer Curve you are on. And this is only common sense. If tax cuts ALWAYS brought in more tax revenue, then let’s cut taxes to 0.0000000000001% and we’ll have the debt paid off in no time! We also cannot simply cut domestic spending and get out of this. The time for that is WAY past. Simply cutting “fraud, waste, and abuse” will hardly put a dent in it, despite popular fantasies about government bloat. If you really want to cut spending, make people pay for what the government is spending. If you want to shrink the government, make the voters actually pay for their government. Stop the free ride. So what does this mean for 2012? I don’t expect any Republican to have the guts to propose a tax increase, no matter how high the debt. So I would look to a candidate who showed real leadership when faced with a deficit. Any knucklehead can cut taxes and run up the debt. That’s easy. Shoot, Bush could do it. I want to see a candidate who made tough choices that actually closed the gap, whether in the House, Senate, or Governor’s mansion. I want someone who was willing to do what needed to be done. Folks, it’s not 1981 any more, and we can’t promote the same policies that made sense in 1981. We can no longer afford the Empire. We cannot afford all of the good things that government can do for people, and we cannot afford tax rates that do not pay for what we spend. It is time to cut spending, and raise taxes. The 25 year bubble has popped. We can’t fake it any longer, and the longer we try the worse it is going to be. It is time we stopped lying to ourselves about money. Let the Era of Austerity begin. Very true, this problem has gotten out of hand, and no one is prepared better to continue what has been done than Obama. This is a terrible time to have a Democrat in the whitehouse. By the way, who do we answer to anyways when it comes to “our national debt” maybe if everyone knew the answer to that question, maybe out debt wouldn’t be so out of control. If we owe our debt to ourselves, I don’t see why spending will ever slow down, do you? Kind of yes, kind of no. I agree that we as the GOP must take full responsibility for our hand in creating the current deficits and debt. But just raising taxes will NEVER solve the problem because no matter how much extra money the government takes in, it will spend it on something else and create even larger deficits. Hundreds of years of history, with only a few that had balanced budgets, bear this out. We absolutely must decrease domestic spending – and here’s the rub: we’re not going to be able to make a dent just by talking about discretionary spending. We need to take on welfare – Medicare, Medicaid, Social Security, Food Stamps, etc. Those social welfare programs eat up well over 50% of our federal budget every year, leaving us little to work with and showing just how ridiculous focusing on “pork” really is. • Institute a 1% federal sales tax applicable to every good and service purchased. Include in the legislation that the total revenue from this tax must go directly to paying down our national debt, and that when the national debt hits zero, the tax is automatically eliminated with no opportunity to reinstitute it unless deficit spending occurs – and only then with a supermajority vote. • Pass a balanced budget amendment requiring every budget submitted to Congress to be balanced except in the case of national emergencies, such as war or Katrina-like national disasters. • Completely and totally privatize Social Security. The idea that the federal government is involved in a retirement program is philosophically ludicrous, and even moreso when you see that the average rate of return on SS investments is less than 2%. Sell it to the American public as a X years-long phase out plan and that they are getting more of their money on every paycheck to put in a retirement account of their choice – more money in the hands of more people, giving them more freedom and more choice! With the right salesman (or woman) this could be a winner. Oh, I forgot a couple other things, too – privatize the Post Office, which loses money every year they’re in existence. There’s probably a slew of entrepreneurs that would jump at the chance to open a mail delivery company, and I’ll bet you anything they’ll do it more cost effectively than government workers. Also, privatizing Social Security frees up billions of dollars (if not more) of business money, since companies will not be paying half of every single employee’s SS taxes any longer — allowing them to invest in technology, more jobs, etc. It could lead to a huge economic boom. I agree that we as the GOP must take full responsibility for our hand in creating the current deficits and debt. But just raising taxes will NEVER solve the problem because no matter how much extra money the government takes in, it will spend it on something else and create even larger deficits. Amen a thousand times Matt C.
Tax cuts are not the problem. The three most infamous supply-side tax cuts: the Kennedy Tax cuts, the Reagan Tax Cuts, and the Bush Tax Cuts, all resulted in INCREASED revenue. The problem is that Government has never cut SPENDING except for a few year in Reagan’s first term and for a few years in the 1990’s. The idea that placing additional an tax burden on job creators and American families will result in more prosperity is ludicrous, quite frankly. This is where “The Old Man” was right. Many ridiculed his constant harping on Earmarks and Pork Barrel spending during the campaign. But let’s give credit where it is due, he was right—it is the spending that is killing us. I agree with most of #6, and I hope I emphasized that we need to cut spending as well as raise taxes. I like your idea of a national sales tax to pay off the debt. I agree they are not the problem, in and of themselves, but when we are so far in hoc, they become part of the problem. To clarify, the purpose of tax increases would not be to create prosperity, but to avoid disaster from the mountain of debt. That’s why I tagged it the “Era of Austerity.” It’s not so much about artificially creating boom times anymore through buying what we cannot afford, but heading off catastrophe by paying for what we already bought. THE EMPHASIS NEEDS TO BE ON SPENDING CUTS!!!!!! It will make a huge difference. It pissed me off every time during the debate when Obama would say we need a scalpel instead of an axe. We do need an axe. He needs to be well aware of these numbers! The difference is your mortgage is an amortizing loan that is structured for payoff in a set number of years, with the qualification that you have the income those payments. The government is paying interest only, and STILL can’t make the payments. #1, the debt is owed to foreign investors, generally the Chinese and Japanese. Our government can spend with abandon because, until now at least, China has been willing to foot the bill, having confidence in future payout. Which is what happens when foreign countries start to smell trouble and unease and stop loaning us money in effect to pay for our debts. Obviously the dollar is considerably studier than the Argentine peso was, but with the comparative strength of alternate foreign currencies, particularly the Euro, this is not impossible. It doesn’t matter how we cut it, but it needs to happen soon. Taxes must go up, and those programs have got to start getting trimmed. With respect to that, I really like your ideas MattC. The problem is political feasibility. I’m afraid that short-sighted voters will not have the will to do anything about it until it’s too late. The dollar could be headed the way of the Peso. Consider that our current accounts deficit (trade deficit plus budget deficit) had been running about $1 trillion a year. This year, it’ll probably be around $2.6 trillion (with the “stimulus”). That means a net outflow of $2.6 trillion this year in capital. The world is awash in dollars. If China didn’t artifically peg its currency to the dollar, the dollar would immediately weaken. And where are the trillions coming from that the Fed is handing out? Presumably, the printing presses. I don’t see how we can avoid a massive weakening of the dollar, coupled with sky high inflation and interest rates. Y’all may want to think about locking in 30 year mortgages, btw. I wouldn’t be a bit surprised if mortgage rates are in double digits in 2-3 years. I agree with MWS, that we seriously need to consider tax-hikes. Republicans have married the idea that tax-cuts are always good, the logical conclusion to that is that it would be good to have no taxes, and therefore no government. Therefore, we’re stuck advocating the idea that’s logical conclusion is anarchy. I think this hurts us politically as people look at Republicans and we’re not expressing a real idea of what think the ideal rate for taxes, or spending is, instead we make it seem that its ideal not to have taxes and spending; meanwhile the Democrats come across as willing take a critical look at what taxes and spending should be. I don’t think the Democrats have come to the right conclusion, but Republicans need to anaylize things beyond less spending and less tax-cuts. I stop reading at this point: “That means that the next Republican President- even if she wins in 2012-”. Good piece MWS. I’m inclined to agree. The national debt is far and away the issue that I am most concerned about as a voter. I wouldn’t object to a tax increase to begin actually paying down principal on it. Though I’d want the tax increase to be across the board so that the 50% who don’t pay taxes would have to start, even if was only a modest amount. It’s ridiculous that half the people in this country pay no taxes and enjoy all the benefits. 17, Well there’s some people who can’t make money and who it doesn’t make sense to tax. Also, unfortunately we’ve got to consider the implications of being the party who’s calling for tax-hikes one the lower income people. I think a big reason for Obama’s sucess, was that he was able to pound home the idea that his tax plan benefited 95% of Americans more than McCain’s. Honestly, I’m surprised I haven’t gotten a more hostile reaction than I have. Some have rightly pointed out that spending has to be cut, that tax increases must be accompanied by spending cuts, that tax increases should go to pay down the debt, and should be shared by all. Hopefully this is representative of the party as a whole. If voters get serious about the debt, their leaders will follow. 20, Don’t get your hopes up. Post this on RedState and I think you’ll get your hostile reaction. That’s one reason Matt C’s national sales tax makes so much sense. Don’t let your misogyny keep you from the discussion! I have heard that the 11 trillion dollar debt figure is not the useful figure to use as it includes debt owed by one part of the government to the other. Someone told me the public debt which is what we actually owe is more like 6.3 Billion dollars. That’s still huge though. The 6 trillion figure pretends that the money borrowed from the Social Security Trust fund is still there. Good post MWS, and I too am surprised that the reaction wasn’t more hostile. I think the reason is that what you wrote was simply too well argued for anyone to strongly disagree with. I think a good place to start would be an increase in the gas tax. But you can’t get elected calling for that. “If it seems that raising taxes is the only way to reduce the national debt, at least when so much spending is mandated by “entitlement” programs, that only shows the need for an economic dictionary. “Taxes” is one of those treacherous words with more than one meaning, enabling politicians to shift back and forth between meanings when they talk. This was one of the better posts I have seen on here lately. Not that I agree 100% with the proposals, but it was innovative and smart. I agree that this is a monstrous problem, but I am not convinced that significant tax increases are the solution. I do, however, like the 1% national sales tax with all of the caveats that Matt mentioned and getting rid of social security. The problem, as has been stated, is the political viability. Implementing the necessary changes would be political suicide for the sitting President and maybe the party that institutes it. The only way I ever think it would be possible, barring a complete collapse of our country is a 2nd term president with an veep that is not running in the next election. Basically, what we had in Bush. This president will also have to have a lot of cojones as well. Even then I doubt congress would ever agree to it. MWS and Kavon, do you mind if I repost this and some of the comments on both of my blogs at dryflypolitics.com and swint.instablogs.com? Congrats on the post. A lot of good insights. That’s true, but NYU professor Roubini, who is a notoriously cynical economist right now, is saying that China is so tightly linked to our success (as our other nations) that to close off the tap would be disasterous for them. Now that’s what he believes. I agree, but at some point inside the next 50-100 years they will close it off and become the world’s #1 superpower. Britain choked on the gluttony of empire and imperial conquest. We’re going out with a whimper on the sloth of entitlements. A national sales tax is the last thing we need. It may sound like a good idea, but it would lead us to the same situation as Europe. A high VAT (sales tax) and a high personal income tax. Do you think a 1% national sales tax would stay at 1%? Of course not, it would be increased to pay for … (fill in the blank). In fact look at Europe closely, because that is where the Dems want to lead us. High taxes, the government in charge of many many things and very little productive growth. That’s not what I’m proposing. I’m proposing we pay off the debt, and that will take higher taxes as well as reduced spending. That might be what you are proposing, but in reality it would not happen. I agree with Tom’s skepticism of the national sales tax: It would rise over time, especially because another type of federal tax would simply make it easier for politicians to play three-card monty stunts with revenue streams. Also, although consumption taxes, flat taxes, and the Fair Tax all have their appeal, I can say from living under the 16 percent VAT regime in Germany, a lot of economic activity occurs “off the books.” Dodging taxes for services is rampant in the informal economy due to the punitive VAT rate (now 20 percent). But if it weren’t for this gray market, many would not even be able to afford to hire the very services they provide for others. I knew many laborers such as plumbers and roofers who did much of their work after hours on a cash basis for friends of friends, and who said that they couldn’t actually afford the rates they officially have to charge thanks to the VAT and various strangulatory regulations. As to Matt’s (MWS’s) general point: Yes, tax hikes do deserve sincere discussion, but I’d frame it as an either-or proposition. Either we raise taxes or cut programs. Tax hikes should be addressed in the context of general tax code reform — tax rebalancing rather than higher taxes. But I doubt many would take tax-cut bidding wars like we had in the last primary all to seriously. I’ve been worrying about this for quite a while. Our country is running toward bankruptcy faster and faster. #34, I’ve got to almost entirely agree with MarkG here. Our whole set of taxes need to be rebalanced with an eye towards increasing revenue for debt repayment. This is my first post in about 2 months, that is quite a long time and I apologize to my readers. Following the election and it’s aftermath, I was so burned out from blogging that I needed some time away to clear my head, purge myself of politics, and enjoy college football (way to go UTES!). I decided that I would get back to blogging on inauguration day and focus much of my writing on following Barack’s Presidency. There are three striking observations that I have regarding the period of transition between President Bush and President Obama. 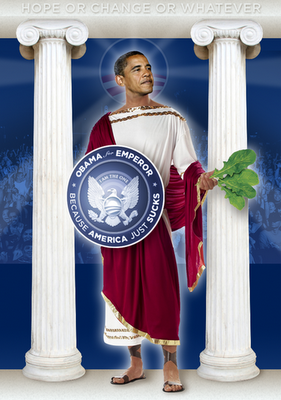 The first observation is the cult-like fawning and love our media and many of our people have for Obama. I recognize that this is an historic election. I too am excited about our first black President and I am proud of our country. But the fawning is getting out of hand. I went down to DC a few weeks ago, bought a Metro ticket and the ticket had a picture of Obama printed on it. Are you kidding me? People through the country are gushing, crying, and nearly worshiping Barack. It is getting out of hand. If I didn’t know better I would think that we are ushering the next emperor of the Roman Empire or the successer to Kim Jong Il in North Korea (have you seen the god-like environment he has created there? Crazy.) I don’t blame any of this on Barack Obama himself. I don’t think he has encouraged it, but it does appear that it may be getting to his head. It will be interesting to see. The second observation is the extremely smooth transition provided by President Bush for the incoming Obama administration. I think it says a lot about the character of President Bush for the way he has handled the transition. It has arguably been the smoothest, most productive, and most efficient transition in our history, especially considering it is a transfer of party as well. I think President Bush really respects the office he holds and believes it should be held above partisanship. Regardless of what you may think of Bush, you have to admit that he has handled the transition well. Finally, I have noticed with great interest that Barack Obama sure has been talking like a moderate-conservative. I am pretty well fine with his cabinet appointments. I am absolutely thrilled that he is leaving Secretary Gates at DoD, for example. Really I question only two appointments (that I have noticed) thus far, Tom Daschle at Health and Human Services and Leon Panetta at CIA. What? Leon Panetta will be serving as DCI? A man with zero intelligence experience? I am more qualified for that post than he is. Well, ok, I have more intel experience, but he has me on presidential employment, management, leadership, and all around good looks. Anyway, Barack has undoubtedly moved to the right with his pre-inauguration actions and it is making the lefties who supported him very nervous. But I think the realities that face the President of the United States force any president to govern pragmatically and realistically rather than ideologically; at least in terms of major issues like security and economy. The most partisan impact a President has comes with lower-level issues like social issues and, sadly, education. Even President Bush (contrary to the mistaken beliefs of his haters) governed as a moderate. He was never a extreme right winger, an extreme right winger would never spend like Bush did for example. All in all, Obama is off to a pretty good pre-start. It will be an interesting ride beginning today with his inauguration. Congratulations President Obama.